1, 2, 3, 4. 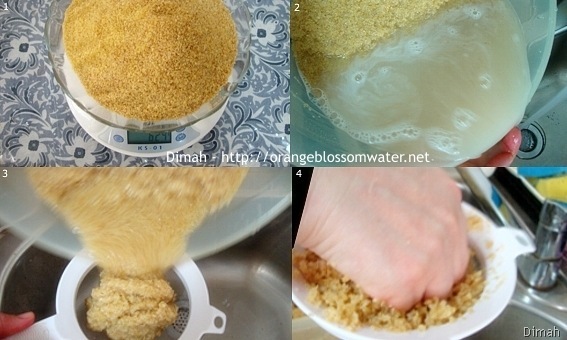 Prepare fine bulgur wheat, rinse it in several changes of water, then squeeze out all water completely. 5. Add ground sweet paprika and salt to bulgur, and set aside in the refrigerator for two hours. 6. After two hours, attach the fine holed plate to the meat grinder. 7. To the grinder, add bulgur, and onion quarters, and grind. 8. 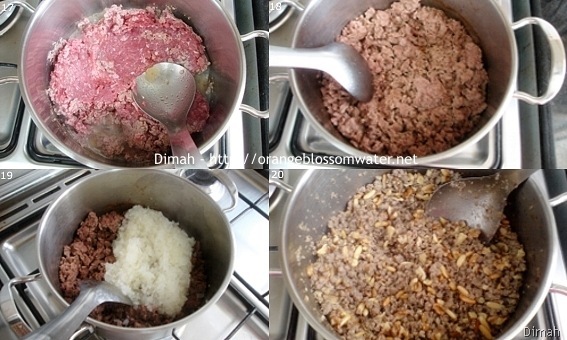 To the ground mixture of bulgur and onion, add ground meat. 9. 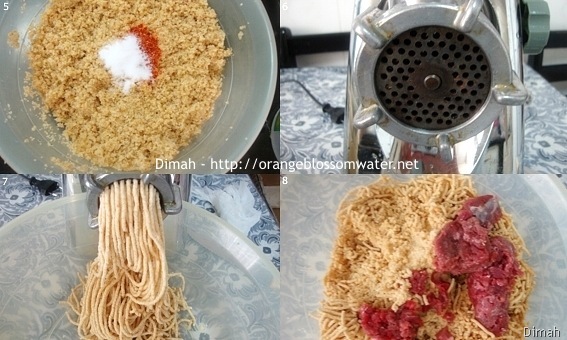 Grind the mixture of bulgur, onion and ground meat, then knead the dough with your hand. 10. Set the dough aside in the refrigerator covered with damp cloth. 11. Finely chop onion, then add salt to onion, rinse with water and strain. 12. In a pan, heat 1 tsp ghee. 13, 14. Saute onion until transparent, then set aside. 15. In another pan, heat 1 tbsp ghee, and add pine nuts and keep until golden brown in color, then remove and place on paper towel and set aside. Then to the same ghee, add almonds and keep until golden in color, then remove, place on paper towel and set aside. 16. To same ghee you used for pine nuts and almonds, add chopped walnuts and keep until golden in color, then remove, place on paper towel and set aside. 17. In a deep pot, heat 1 tbsp ghee. 19. Once the meat is cooked, add chopped onion. 20. Add nuts to meat, add salt and black pepper and stir for few seconds then turn off heat, (Note the meat should be completely cooked before adding walnuts, when you cook meat, there’s water comes from the meat, but this water evaporates during cooking, so once this happen and the meat is completely cooked and no water remains you can add nuts). 21, 22. In a bowl, add ghee and mix it with black pepper, and set aside. 23.Prepare two baking dishes, I used two fluted quiche Pyrex dishes (each is 10 1/2 inch diameter x 1 3/8 inch (26.7 cm diameter x 3.5 cm), the capacity is 1.6 qt), grease the dishes with knob of ghee. 24. Prepare 1 cup of lightly salted water, and bring kibbeh dough. 25. Knead kibbeh dough with your hand, and gradually add the water while you are kneading, I add 1/2 cup of lightly salted water, and knead, you should feel that you can shape the dough easily and rolling it, too. 26. Divide the dough into four equal parts. 27. Prepare a piece of a plastic wrap, and use it to help you to roll out the dough. 28. 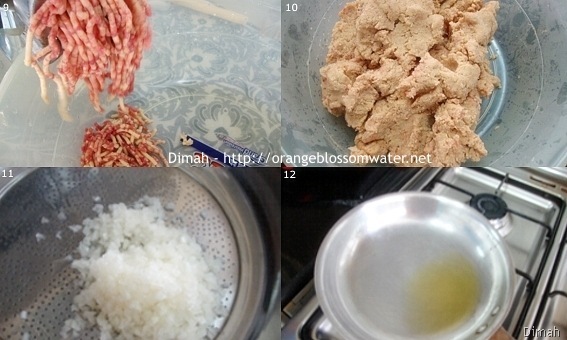 Roll out the dough into approximately 1/3 inch (0.8 cm) thickness, do this step with the four parts of kibbeh dough. 29. Bring the first baking dish, and place the rolled kibbeh dough on the bottom of the baking dish, and smooth the edges with your fingers. 30, 31. Add knob of ghee to the surface of the dough and spread with your fingers. 32. Divide the filling into two equal parts (you will use half of the filling for this baking dish, and the other half for the other baking dish), spread the filling evenly over the layer of kibbeh to within 1/2 inch of edge (1.3 cm) and press the filling with your fingers. 33, 34. Lay the other piece of the dough over the filling and press strongly, and smooth the edges with your fingers. 35, 36. 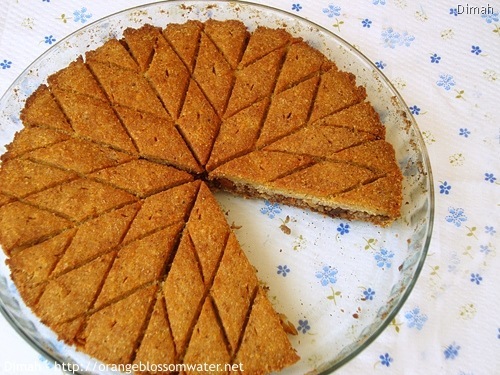 Bring the other 1/2 cup of lightly salted water and dip knife in water, and cut the pie into 8 equal parts, you should cut deeply and reach the bottom layer of the kibbeh. 37, 38. 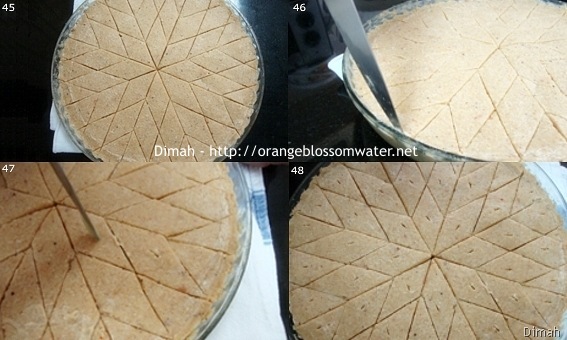 Dip knife in lightly salted water, and cut 3 parallels evenly spaced on side of the triangle. 39. 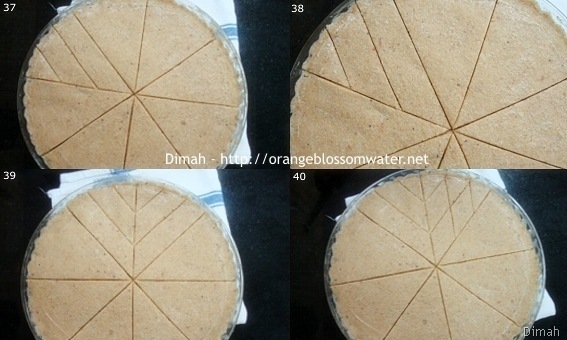 Dip knife in lightly salted water, and cut another 3 parallels evenly spaced on the other triangle like mirror. 40, 41. Dip knife in lightly salted water, and cut two lines evenly spaced on each triangle to obtain diamond shape. 44. And this is the end result, you will get a star with 8 branches in the center. 45. 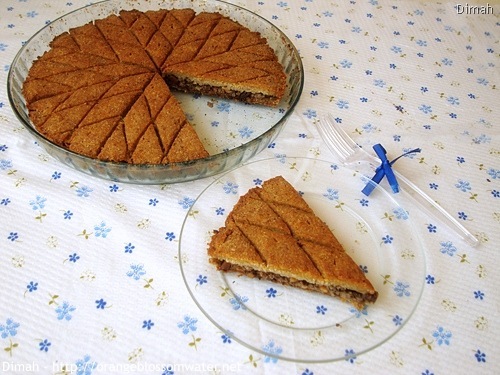 These decorations (steps 37 – 44) are done to the upper surface only, they are shallow and you should not go deeply to the bottom layer of kibbeh. 46. Dip a knife in lightly salted water, and insert the knifepoint between edges and dish then run it all around. 47. With your knifepoint, make small cut in each diamond. 49, 50, 51. Add ghee generously to the surface of kibbeh and spread with your fingers. Repeat all the above steps with the second baking dish. 52. Heat the oven, turn on the oven upper burner “broiler” on low temperature, and turn on the bottom burner “bake function” at 320°F (160 °C) (I’ve done this step of heating oven 15 minutes before placing the dish in oven to cook), place the two dishes in the oven (rack position the first from bottom), and cook kibbeh for 30 minutes and after 30 minutes the surface will be golden brown in color, so turn off the broiler and keep the bottom burner “bake function” turned on and continue baking for 20 minutes or until the kibbeh is cooked. 53. 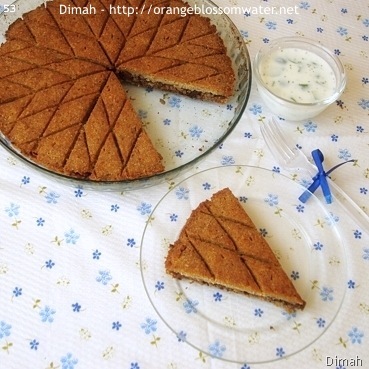 Serve kibbeh hot with salad (salad is prepared from tomato, cucumber, flat parsley, mint, onion, lemon juice, olive oil and salt), or Laban Bi-Khiar (yogurt diluted with water and mixed with cucumber cubes and dried mint), or laban a’yran (yogurt drink), leftovers can be reheated and served hot or can be served cold and they are delicious. 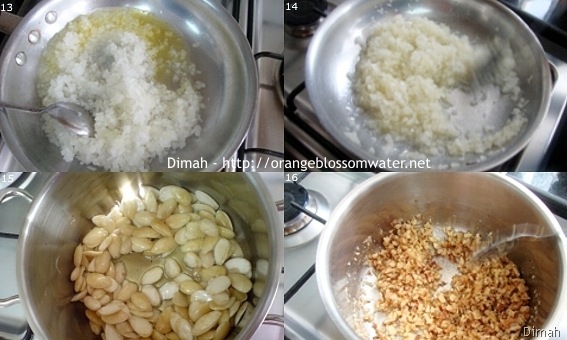 Prepare fine bulgur wheat, rinse it in several changes of water, then squeeze out all water completely. Add ground sweet paprika and salt to bulgur, and set aside in the refrigerator for two hours. After two hours, attach the fine holed plate to the meat grinder. To the grinder, add bulgur, and onion quarters, and grind. To the mixture of bulgur and onion, add ground meat. Grind the mixture of bulgur, onion and ground meat, then knead the dough with your hand. Set the dough aside in the refrigerator covered with damp cloth. Finely chop onion, then add salt to onion, rinse with water and strain. In a pan, heat 1 tsp ghee. Saute onion until transparent, then set aside. In another pan, heat 1 tbsp ghee, and add pine nuts and keep until golden brown in color, then remove and place on paper towel and set aside. Then to the same ghee, add almonds and keep until golden in color, then remove, place on paper towel and set aside. To same ghee you used for pine nuts and almonds, add chopped walnuts and keep until golden in color, then remove, place on paper towel and set aside. In a deep pot, heat 1 tbsp ghee. Once the meat is cooked, add chopped onion. Add nuts to meat, add salt and black pepper and stir for few seconds then turn off heat, (Note the meat should be completely cooked before adding walnuts, when you cook meat, there’s water comes from the meat, but this water evaporates during cooking, so once this happen and the meat is completely cooked and no water remains you can add nuts). In a bowl, add ghee and mix it with black pepper, and set aside. Prepare two baking dishes, I used two fluted quiche Pyrex dishes (each is 10 1/2 inch diameter x 1 3/8 inch (26.7 cm diameter x 3.5 cm), the capacity is 1.6 qt), grease the dishes with knob of ghee. Prepare 1 cup of lightly salted water, and bring kibbeh dough. Knead kibbeh dough with your hand, and gradually add the water while you are kneading, I add 1/2 cup of lightly salted water, and knead, you should feel that you can shape the dough easily and rolling it, too. Prepare a piece of a plastic wrap, and use it to help you to roll out the dough. 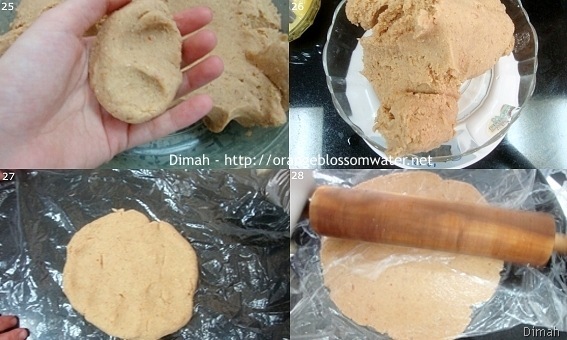 Roll out the dough into approximately 1/3 inch (0.8 cm) thickness, do this step with the four parts of kibbeh dough. Bring the first baking dish, and place the rolled kibbeh dough on the bottom of the baking dish, and smooth the edges with your fingers. Add knob of ghee to the surface of the dough and spread with your fingers. Divide the filling into two equal parts (you will use half of the filling for this baking dish, and the other half for the other baking dish), spread the filling evenly over the layer of kibbeh to within 1/2 inch of edge (1.3 cm) and press the filling with your fingers. Lay the other piece of the dough over the filling and press strongly, and smooth the edges with your fingers. 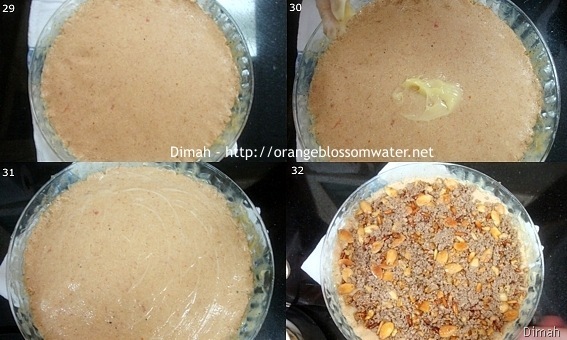 Bring the other 1/2 cup of lightly salted water and dip knife in water, and cut the pie into 8 equal parts, you should cut deeply and reach the bottom layer of the kibbeh. 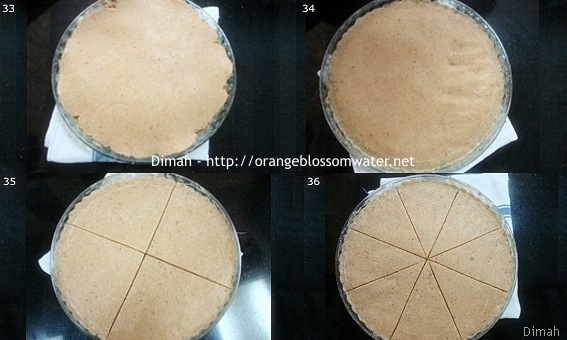 Dip knife in lightly salted water, and cut 3 parallels evenly spaced on side of the triangle. 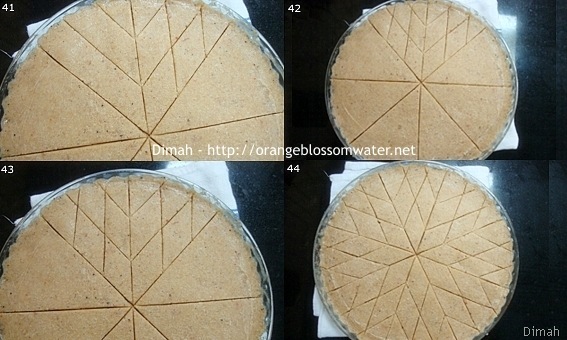 Dip knife in lightly salted water, and cut another 3 parallels evenly spaced on the other triangle like mirror. Dip knife in lightly salted water, and cut two lines evenly spaced on each triangle to obtain diamond shape. And this is the end result, you will get a star with 8 branches in the center. 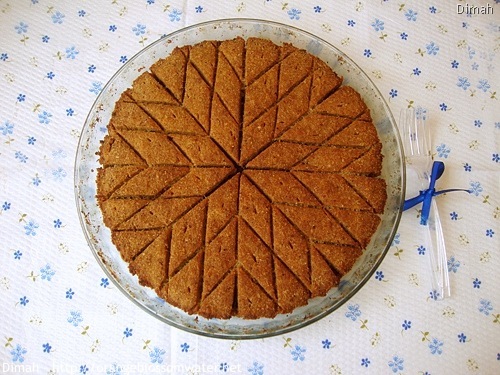 These decorations (steps 37 – 44) are done to the upper surface only, they are shallow and you should not go deeply to the bottom layer of kibbeh. Dip a knife in lightly salted water, and insert the knifepoint between edges and dish then run it all around. With your knifepoint, make small cut in each diamond. Add ghee generously to the surface of kibbeh and spread with your fingers. Repeat all the above steps with the second baking dish. Heat the oven, turn on the oven upper burner “broiler” on low temperature, and turn on the bottom burner “bake function” at 320°F (160 °C) (I’ve done this step of heating oven 15 minutes before placing the dish in oven to cook), place the two dishes in the oven (rack position the first from bottom), and cook kibbeh for 30 minutes and after 30 minutes the surface will be golden brown in color, so turn off the broiler and keep the bottom burner “bake function” turned on and continue baking for 20 minutes or until the kibbeh is cooked. 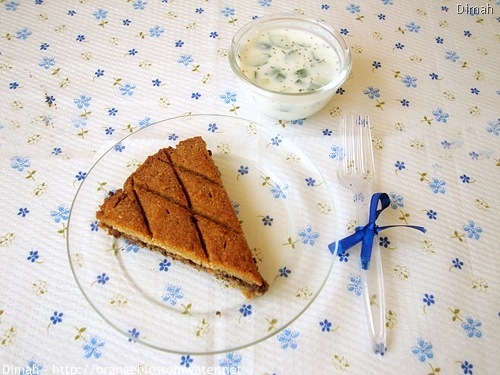 Serve kibbeh hot with salad (salad is prepared from tomato, cucumber, flat parsley, mint, onion, lemon juice, olive oil and salt), or Laban Bi-Khiar (yogurt diluted with water and mixed with cucumber cubes and dried mint), or laban a’yran (yogurt drink), leftovers can be reheated and served hot or can be served cold and they are delicious. The 180 g ghee is mixed with black pepper and used for the two dishes for all the steps from step 24 to 51. The oven upper burner “broiler”, this has two temperatures which are high and low. The oven bottom burner “bake function”, this is divided into these temperatures (from 248 °F (120°C) to 518 °F (270 °C)). This entry was posted on Saturday, October 16th, 2010 at 3:10 PM	and is filed under Syrian Cooking. You can follow any responses to this entry through the RSS 2.0 feed. You can skip to the end and leave a response. Pinging is currently not allowed. Beautiful kebbe!! This is one of my favorite dishes!! Great shots too! 100 percent authentic and beautifully improvised kebbe….I eat this normally with a cold tzatziki!! Yum! This looks delicious and well worth all of the steps involved! What a beautiful dish and GREAT photography! What an amazing job you did cutting the kibbeh. This looks like a very tasty recipe. Waow, this kibbeh looks so beautiful. i love these design-cuts on the top and the very clear explanations you are giving! Dimah, this is one of my favourites! i LOVE THE DIAMOND PATTERN YOU DID. Me and my autine lamia always try ot outdo each other when we make this. It so good. We serve it with muttabl and pommegranites and also instead of ghee we use olive oil. Soo good. Lovely pictures. Wish i had some now.! wow, this is new to me and it looks both beautiful and delicious! wonderful job! A splendid dish! That is a speciality which is on my to-make list. I really love those decorations. I did made kibbeh once before, but it was nothing compared to this. Your looks simply amazing, I just love your clear instructions. I’ll definitely try this sometime. BTW thank you for visiting my blog and leaving your lovely comments. 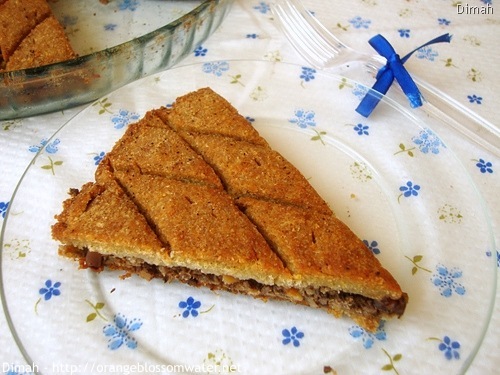 This kibbeh looks adorable..my husband is droolin gover it right now and wants me to make it asap…. Thanks for stopping by.I love the meaning of your name..so beautiful..read it in the ‘about’ section. This is s new dish to me, but it sounds scrumptious. The pattern makes it looks so pretty. 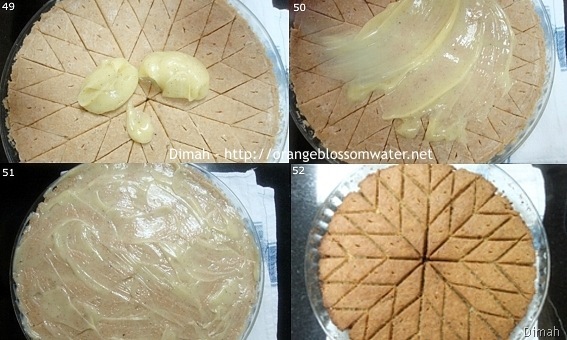 Love your step by step photo, it really helps to follow the recipe. A beautiful and unique dish! woow.. it looks so great and congrulation for TOP 9 , u were buzzed;) also shared it in my fb page.. i really loved it and want to share with everybody. 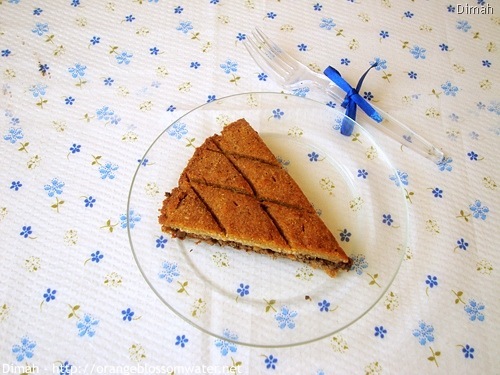 you may add me Yesim Caglar..
What a beautiful kibbeh! Congrats on #1 in Top 9! Wow, how beautifully decorated! I’ve never seen such a lovely savory pie before, and now I want to try making such an ornate topping as well! 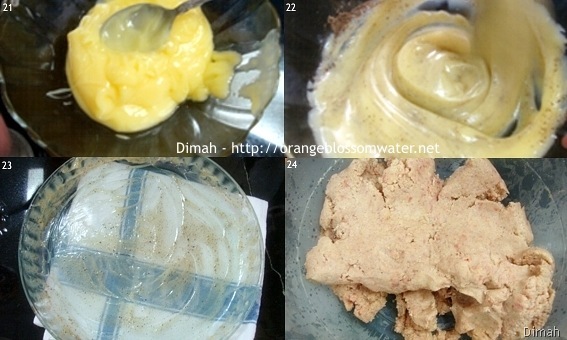 Dimah, you did such an amazing job documenting this recipe! I’ve never heard of this recipe before, but I think it would be popular in our household, it’s printed for a future use! Thanks! What a lovely recipe! Do you have one for raw kibbeh? My very first boyfriend was of Lebanese descent and I spent two years having Sunday dinner with his family a very long time ago (1954-1956~!). Every week it was wonderful roast chicken, fabulous fatoush salad and raw kibbeh with pita bread. I think I spent an extra year dating this adorable boy because of the kibbeh (and the fact that he was incredibly cute, too). 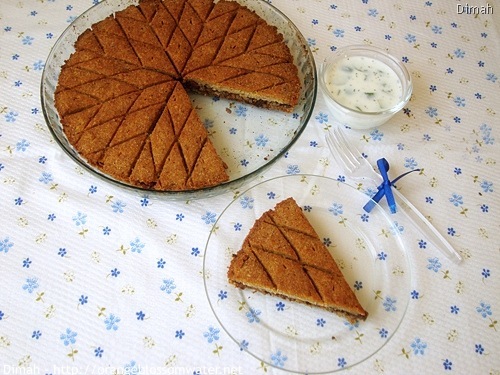 I love kibbeh and this looks so amazing! delicious. This looks so beautiful! 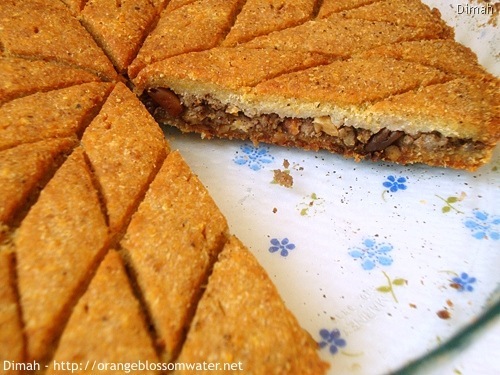 I never had kibbeh pie before but you have me convinced it must be delicious =D Congrats on top 9! Adorable pattern! I like the visual instruction – makes it pretty and easy to follow. This looks absolutely so appealing! I love the combination of bulgur and meat. and we have a very similar dish in Turkey, which we call stuffed bulgur kofte(icli kofte). We don’t layer it into a tray, we make balls from a bulgur dough and stuff it with meat and walnut. Yours sounds like a great alternative. Drooling! This is amazing! A lot of work but well worth the results. Beautifully done. Congrate on Top 9 in Foodbuzz, really worth the effort! This dish looks amazing…my coworker once brought in Kibbeh and I’ve been craving it for a long time since! I love the flavors in this…can’t wait to try making it in my own kitchen. Gerald: Thank you so much for the kind comment! Erin @ EKat’s Kitchen: Thank you for the lovely comment! Sweet Artichoke: Thank you so much for the kind comment! Umm Mymoonah: Thanks for the kind comment! Tanvi: Thank you so much for the sweet words! Nancy/SpicieFoodie: Thank you so much for the kind comment! Sommer @ A Spicy Perspective: Thanks! Yesim: Thanks my friend, you are so kind! Lilia: Thank you so much! Linn @ Swedish Home Cooking: Thanks for stopping by! zerrin: Thank you so much! we also make kibbeh in oven in other way almost similar the way you mentioned but we don’t keep them as ball, they have a shape and we call it “kibbeh qerfaliye”. Lisa~Korean American Mommy: Thank you so much! Karen: Thank you so much for the sweet comment! this looks so beautiful:)thank you for sharing this and for visiting my website. have a nice day. We have a similar dish in Armenia too and I love it. It’s so much easier to make than the kufteh but has the same flavor. Thanks for bringing back a memory of “home” to me! Lovely presentation! Thank you for showing how to make the pattern! I don’t eat meat, but wow is the top of this pretty! Great job :). Wow, this looks sooo good. 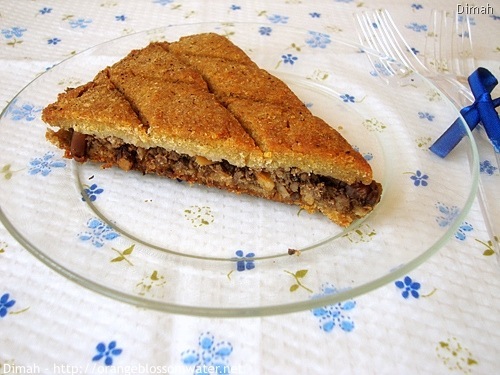 I love kibbeh but I’ve never seen it made as a pie like this before. Love the decoration on top, too. I’ve never attempted to make my own because it seems so difficult but I might have to face my fear and give it a try soon. Oh my Dimah, this looks amazing! I am so impressed. Thank you so much for sharing. Wow this looks fabulous and I love all your step by step photos! I esp like how you showed how to make the design on the top. :) Congrats on Foodbuzz top 9! The Mom Chef: Thanks for the lovely comment! Xiaolu @ 6 Bittersweets: Thanks for coming by! turkey’s for life: Thank you so much for the kind comment! hope you try it! The Cilantropist: Thanks for stopping by! I love the care displayed in your posts and how well this kibbeh turned out; ours is slightly different (more meat than bulgur) but yours is definitely healthier! I love it.My husband loves too. I am giving this form of baklava.Definitely going to try it on kofte. Thanks for sharing the info with me, I enjoy reading about food in other countries. Hope you’re having a wonderful day..